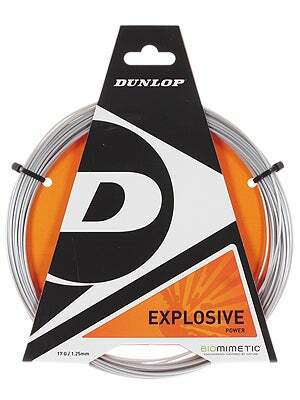 I was drawn to the Dunlop Explosive 17 tennis string mostly because of the name, explosive. I am always looking for tennis string that will add a new element to my tennis game, so I figured reviewing the Dunlop Explosive 17 would be a good fit. Of course the less than $10 price tag also made this monofilament string a lot more attractive. Stringing up the Explosive was painless, weaving and knotting was quick and easy. No real problems there. I did string this up as a one-piece at 44lbs, hoping I would get lots of pop off my strokes. I started off slow, ya know, just to warm up and find my stroke with the string. When I got warm and felt like I could really go after my groundies, the Dunlop Explosive really showed me what they could do. I was really impressed how crisp the strings felt, I could feel the pop off the bed and could see the ball fly across the net with some ridiculous pace. I was pretty happy with the amount of pop I was getting. As my review session went on, the strings began to show me some of characteristics that I did not like. I was really having a hard time producing good spin. Don’t get me wrong, I could get some spin but it was nothing close to what I have been able to produce with similarly shaped strings (round). That, however, did not make it a bad string at all. I was still seeing promise in the Dunlop Explosive 17, especially with the control. I could place it within a foot of where I wanted it to put the ball. Moving the ball side to side was effortless, I didn’t have to muscle the ball to change directions. Accessing the power from the Dunlop Explosive was a breeze. All I had to do was have a smooth stroke and the ball would rocket off the strings. Since the strings provided very little spin, the tennis ball would stay low and zip through the baseline. I really enjoyed that characteristic. The biggest problem I had was the string vibration. No matter when the ball made contact with the Dunlop Explosive, I felt tremendous amounts of vibration coming from the stringbed. I always have a vibration dampener on my tennis racquet, though I strongly felt that I had to put a second dampener to cut down on the vibration. After the first night of hitting with the string, my arm felt like a wet noodle and my shoulder and wrist really ached. The day after my initial review, my shoulder hurt a lot more, could definitely feel the tendons flaring up; so I took some anti-inflammatories and iced my shoulder. I decided to give the tennis string another go. Again, I was really impressed with the power I was getting off all aspects of my game. I was able to serve really big and hit even bigger groundstrokes. I spent a great deal of time at the net, to see what kind of touch shots I could come up with. Dropping volleys was non-existent, because the Dunlop Explosive is a powerful string, trying to hit a low powered stroke was extremely challenging. All other volleys were nice. This is a really nice offering from Dunlop. The Dunlop Explosive 17 is very powerful and gives incredible control, especially as a full poly setup. I didn’t love the lack of spin, though the power and crisp feeling strings countered the spin. The string is not meant for players who are seeking a soft string, the firmer polyester will hurt your arm if you are prone to injury, though it is a nice string for big hitters. A must try as a full bed.